Kellen Clemens has been playing football as far back as he can remember. After learning the game from his father on their cattle ranch, he went on to set high-school records for the state of Oregon in passing yards and touchdowns. At the University of Oregon, he set single-season passing records and ended his collegiate career as the school’s No. 3 man in both passing yards and touchdowns. After being chosen in the second round of the 2006 NFL draft, Clemens has served as a backup quarterback for the New York Jets, Washington Redskins and Houston Texans. 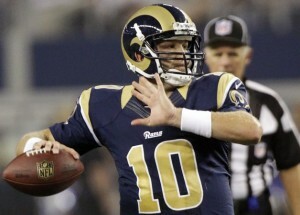 He is heading into the 2012 preseason in that same position with the St. Louis Rams. Despite his long connection with football, Clemens explained to interviewer Trent Beattie that the sport is something he does, while being Catholic is who he is. My dad played in high school as a quarterback, and then as a defensive back at Portland State. I learned all about football from him on our cattle ranch in southeastern Oregon. However, we didn’t have a Pop Warner League where I’m from, so instead of playing on organized teams, I’d play at recess with my friends on the playground. Then, in seventh grade, we jumped right into playing with pads — playing for real, you could say. I’ve been playing “real” football ever since seventh grade. What are some of your top football memories? Playing football in high school was a lot of fun because I was at a small school. That made it possible to play with the same group of guys for four consecutive years. Each year a class would graduate, and a new one would come in; but as far as my own class, we got to play together the whole way through. That’s far less likely to occur at a larger school, where a class can be divided up among different-level teams, and then one year someone might get cut. At a small school such as the one I attended, it’s more like a family of brothers. We would practice, play games and even do off-season workouts together. We just enjoyed being around each other. That’s something that matters more than the actual game itself: the camaraderie formed among the guys. If you talk with retired players about what they miss from their playing days, they’ll tell you they miss the teams they were on and the relationships they formed, rather than win-loss records or awards. The satisfaction of awards doesn’t last. Trophies end up collecting dust, but the satisfaction of the relationships does last. What is most difficult about playing professional football? The fact that it’s a business. It’s not the same as playing in high school, where you have a family type of atmosphere and cohesion that endures for a long period of time. While it still is possible to form lasting relationships, it’s more of a challenge. You can get cut or traded very quickly, so there’s less time to bond. You have to mentally separate the game from the business aspect. On the one hand, you enjoy the game, but on the other hand, you realize there’s the constant pressure to perform with perfection. So many eyes are on you, and everything you do is analyzed. There are certain expectations of you, and this is due in part to the fact that a lot of money changes hands between the fans and the owners, and then between the owners and the players. I’m a cradle Catholic, with four sisters, and the faith was always an integral part of our lives. I went to confession, received Holy Communion and was confirmed. We were taught the difference between right and wrong and enjoyed the stability that brings. We also benefited from being so close to nature on our family’s cattle ranch. That encourages you to be humble and also to respect and work with God’s creation. Then I left my small southeastern Oregon town of Burns to attend the University of Oregon in Eugene, which is the second-largest city in the state. That was a big transition period, where I left almost everything I had previously known. There was a void that needed to be filled, and it became very clear that I had a decision to make: I could either drop the faith or pursue other things, or I could lay claim to it and become the man God wants me to be. It would have been easy to decide in favor of the first choice, because you don’t have your parents telling you when to go to Mass. You’re on your own and have to make your own decisions about what you’ll pursue. That can be a challenge because there are things in college, which seem like fun on the surface but aren’t in harmony with the dignity of the human person and don’t provide lasting happiness. I knew that my relationship with Jesus Christ was more important than anything else in college. I made a conscious effort to deepen that relationship, in part by attending daily Mass. I really started to take the faith as my own, rather than simply relying on others to keep it going. That was a key time in my life, and I look back with gratitude for the grace God gave me to make the right decision. Everything else flows from that decision of how you respond to God’s call. I knew being Catholic was important, but what I’ve come to realize more deeply since college is that being Catholic means everything to me. It’s what I am in my very essence. Football is something I do, but being Catholic is who I am. I’m Catholic in my bones, in my blood — however you want to say it. That is a great way to describe it — Catholic by blood — since Jesus gives us his body and blood in every Mass we attend. One of my favorite passages in the Bible is from John 6: “Truly, truly, I say to you, unless you eat the flesh of the Son of man and drink his blood, you have no life in you. He who eats my flesh and drinks my blood has eternal life, and I will raise him up at the last day.” Jesus wants us to be completely united to him forever, and this unity begins here on earth, primarily through the holy Eucharist. I like to expand my knowledge of the Mass, so one of the most recent books I’ve read is 7 Secrets of the Eucharist by Vinny Flynn. The first chapter is about how the Eucharist is alive. In other words, the Eucharist is not just a symbol but the very Person of Jesus Christ. When you get to know that better, it really changes how you see Mass and how you receive Jesus in Holy Communion. Other than your collegiate years, are there specific times that come to mind when reflecting on your Catholic faith? There are so many good things to think about, but the first one that comes to mind is from April of 2008. My wife, my daughter (who was only 6 weeks old at the time) and I had the honor of being at Pope Benedict’s Mass in Washington, D.C. We even got to sit right next to the aisle where he would be processing. On his way out after the Mass, Pope Benedict stopped and kissed our daughter, and he traced the sign of the cross on her forehead. That was a very special moment we’ll always remember. What do you enjoy most about family life? I really enjoy being married. It’s exactly what I thought of the sacrament as being when I was younger. Sometimes you can look ahead in life and then the reality can be a lot different from what you expected, but with marriage, it is exactly as good as I thought it would be. The Holy Family is our model, as far as how to live our lives. That’s really raising the bar, because Jesus, Mary and Joseph are the ultimate in how a family should function. The Holy Family is an image of the Trinity, with Joseph in the role of God the Father, Mary in the role of the Holy Spirit, and Jesus actually being the Son. This is a beautiful thing to think about and attempt to pattern your own family after. It’s striving for that perfect interaction of the Trinity. There’s a lot of pressure in the business of football, so when you come home to your family, it’s quite a relief. My kids (we now have a son and a baby on the way) accept me unconditionally. They don’t care how well or badly I played that day, or if I played at all. They just want a hug and to be told they’re loved. Family life puts the business of football in the proper perspective, in large part because of the simplicity of kids. We gave our son Michael as a middle name, after St. Michael the Archangel. I’ve always been appreciative of St. Michael’s protective role in driving out Satan. That protection is something I wanted to pass on to my firstborn son, so that if anything happens to me, he can be the guardian of the home. I also appreciate St. Sebastian’s patronage for athletes and Our Lady of Mount Carmel’s patronage of the whole Church. I wear a brown scapular in order to connect to that patronage. This is an election year, so how are you voting? You have to vote for the candidate who is most pro-life. That’s the fundamental issue that underlies everything else. Without life, there are no other issues to discuss. Some people say that other issues are just as important as being pro-life. Being for the poor is mentioned as one of them. Well, who is poorer than a baby? Who has less power to care for himself? Obviously, being pro-life is being for the poor. Beyond that, if you take an adult poor person, the best way to help him is not through a remote bureaucratic system, but through local and personal assistance. Individuals, churches and private charities help the poor much better than the government can. They’re more effective, efficient and enduring. Not to mention, more compassionate. Being for lower taxes and less regulations is compassionate as well, because then you allow private citizens to follow their dreams and carve out their own paths. The less government interference there is, the more job growth you get. It’s really quite simple. You allow businesses to grow by getting out of their way, and then everyone benefits, especially the poor. We don’t need so-called “investment” from the government, which is only taking more of our tax money and pumping it into programs that don’t work. We need real investment, which means less taxation and regulations on private citizens, so they can start or expand their businesses, which in turn means more jobs. This is the truly compassionate thing to do, because then each individual can develop his God-given talents and contribute to the common good. Mitt Romney is the presidential candidate who gets my vote — and in every other race, it will also be the person who is most pro-life, who respects the dignity of the human person and wants to see each of us have the opportunity to succeed.